I’m Dougal Trump… And it’s Not My Fault! There is a mysterious creature living in Dougal Trump’s shed and he is dead if anybody finds out. The author sets about writing his last will and testament, rewarding those who aid him, but mostly leaving unappetising gifts (a pile of washing, a smelly arm cast) to those who fail to understand our young hero. Of course, nothing is ever his fault. Dougal Trump is a great comic creation, who will appeal to annoying younger brothers everywhere – and perhaps even their moany big sisters and useless parents too. Writer Jackie Marchant brilliantly captures that awkward age when everybody else finds you irritating - and makes sure you know it. 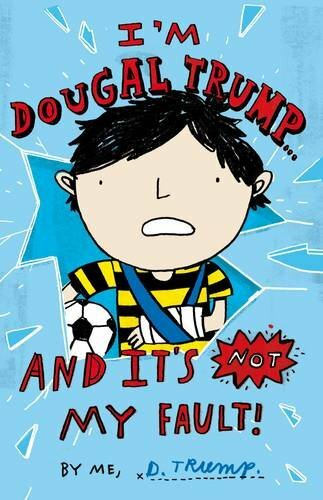 Funny, irreverent and anarchic, Dougal Trump is a very British boy whose life revolves around football and friends and whom trouble seems to follow everywhere he goes. But it is his very ordinariness – his fear of the creature in the shed and its owner, his declared hatred of his older sister, and his quite oblique way of coming to terms with his grandmother’s death – which makes the reader feel Dougal Trump is just the kind of friend, and the kind of story, worth sticking with.